All across the business world, people are talking about the great potential that big data holds for improving business practices and operations. The trucking and transportation industry is no exception. Is Your CSA Maintenance BASIC Relevant Again? Since President Obama signed the FAST Act in December 2015, your fleet’s CSA Maintenance BASIC score has been only visible to you and enforcement agencies. Are Truck Breakdowns Killing Your Fleet’s Bottom Line? The phone rings in your office. You pick it up. One of your fleet’s drivers is on the other end. His truck has broken down and he’s going to miss his delivery. He needs a tow, a repair plan and a hotel room. He is frustrated and angry. The aging of the trucks on American roads is undeniable, leaving fleet managers in search of ways to improve asset utilization. Recent news that truck sales are on the decline point to a trend where fleets are keeping vehicles for longer periods than originally planned. It’s one thing to move your fleet management from a phone- and paper-based system to a computer-based system, but some fleet managers are nervous about taking the next step and moving to a cloud-based fleet maintenance system. Fleet Maintenance Analytics: Is Your Approach Flawed? Fleet managers have more data at their disposal than ever before. However, you may be looking at the wrong data and missing opportunities to improve your operations and bottom line. What data can you ignore, and what data should you pay attention to, when using fleet maintenance analytics to improve the cost effectiveness of your fleet operations? Once your fleet reaches a certain size, practicality demands that your assets be deployed across multiple locations. Although it’s possible to centralize fleet maintenance management – especially if it’s coordinated through a Service Relationship Management (SRM) platform – your trucks, as well as the shops that service them, may be widely dispersed. 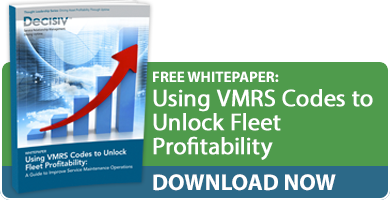 Is Reactive Fleet Maintenance Killing Your Fleet’s Bottom Line? In the old days of fleet maintenance management, service events required a hurricane of phone calls and an avalanche of paperwork. Fleet preventive maintenance (PM) isn’t a one-size-fits-all proposition: Each type or group of assets requires its own service schedule, because each has different specs, depending on its make, model and year, and intended application. The Commercial Vehicle Safety Alliance (CVSA) has scheduled its annual inspection blitz for June 7-9. Are your trucks ready?